"Emotions and Institutional Constraints: A Demonstration Case of Temperature and Insurgent Violence"
Invited for revision at International Organization. This figure contrasts estimated mean attack counts across types of insurgent violence as a function of mean daily temperatures in Baghdad and Basrah using data for most days of the Iraq War (with 95% Confidence Intervals). Consistent with findings from criminology and psychology, the least organizationally constrained attacks, those primarily involving pistols and rifles over which individual combatants exercise the greatest discretion, tend to increase in temperature, then turn negative beyond a certain threshold. The most organizationally constrained attacks–for instance, car and suicide bombings–show little relationship with temperature. Theorists and practitioners of war have long understood acts of violence as jointly motivated by the fighting institution’s strategic calculations and by the individual combatant’s emotions. The combination of empirical barriers and the theoretical assumptions of rational choice theories have hindered observational research on their joint role in producing violence. Leveraging the established phenomenon of ambient temperature’s influence on human aggression, we demonstrate that during the Afghanistan and Iraq wars temperature exercised three substantively large and non-strategic effects on the attitudes and behaviors of conflict participants. Temperature affected the type and intensity of insurgent attacks, the odds of insurgent fatalities during skirmishes, and the willingness of military-age men to endorse violence against international forces. 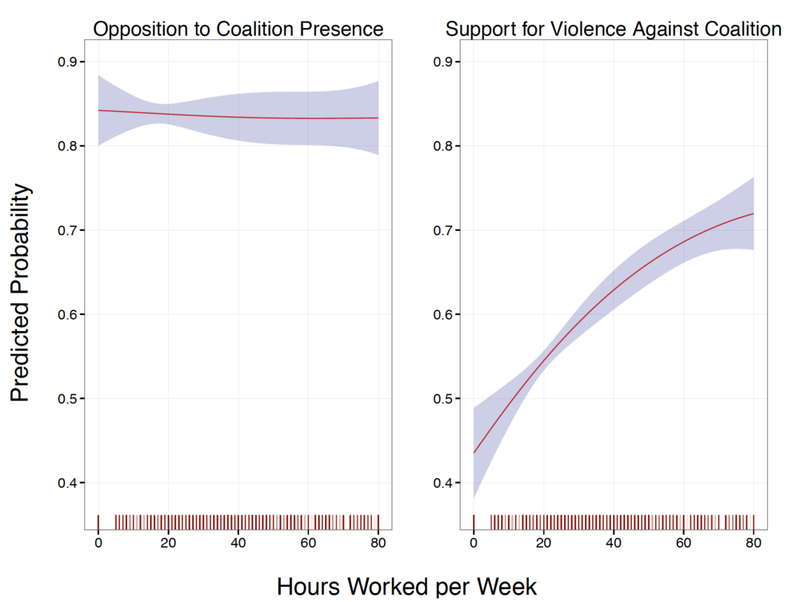 The results suggest that theories of political violence that disregard the influence of emotion are limited in their ability to explain conflict outcomes. The article publishes the U.S. Department of Defense’s official record of Iraq War insurgent violence directed against international and government forces. "Employment Status and Support for Wartime Violence: Evidence from the Iraq War"
Statistical results showing that Baghdad citizens varied little in their opposition to Coalition presence as a function of their employment status. Yet, they differed significantly in their support for the use of violence. The unemployed are often inculpated in violence production during state-state conflict. A common argument describes these individuals as disaffected and inclined to perpetrate affectively motivated violence. Another holds that they are drawn to violent political organizations for lack of outside opportunities. Yet, evidence supporting a general positive relationship between unemployment and wartime violence is not established. Following a large body of psychological research, I contend that loss of employment instead increases feelings of depression, anxiety and helplessness, with effects on perceptions of efficacy and the desire for retribution. Contrary to conventional wisdom, unemployed members of war-torn societies are more likely to reject the use of violence. Drawing from a major, heretofore unreleased Iraq War survey dataset, I find that unemployed Iraqis were consistently less optimistic than other citizens; displayed diminished perceptions of efficacy; and were much less likely to support the use of violence against Coalition forces. "The Effects of Violence Exposure on Parochialism During Conflict." Violence intensifies significantly in Iraq's Sadr City as American forces construct a security wall through the city. A popular adage states that conflict begets conflict. I argue that a fundamental effect of wartime violence on conflict participants may account for a causally reinforcing effect of conflict on subsequent conflict. In particular, I theorize that exposure to wartime violence has a direct psychological effect that renders affected individuals more likely to harbor hostility toward opposing forces (and other out-group members). Violence exposure reinforces individuals' sense of parochialism. Importantly, the type of violence to which such individuals are exposed need not be perpetrated by out-group members (opposing forces, members of competing ethnic groups, etc.). Civilians who have observed violence perpetrated by members of their own perceived in-group are expected to experience the described intensification in attitudes.